Eeeek! I joined the CASology design team! My thanks go out to Melissa and the team!! Today is a new challenge – Late. When I first saw this cue card I had lots of ideas – one of my favorites was “pregnancy” but I just didn’t have supplies to do anything for it…dern! 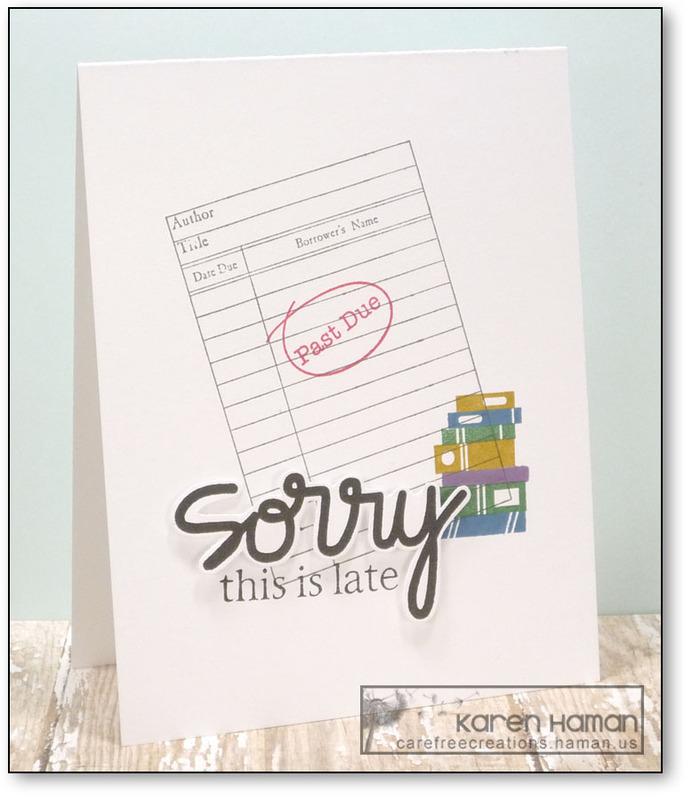 My helpful family said I could do a sympathy card (for the euphemism of “being late”), but I thought that might be a bit too sassy for a new team member. So I put my brain back in gear and realized my library books are due tomorrow. Collages can be hard on a CAS card. I selected just a few images and stamped them close together/overlapping to make it seem like one image. And there is still plenty of white space. To help give some dimension, I fussy-cut the sentiment and popped it up with dimensional adhesive. The scribble circle around “Past Due” is from the PTI It’s Official set. The image has an A+ within the loop. I cut my stamp apart then I was able to stretch the circle when placing it on the block so it would fit around the words which were in the same set. This is a really fantastic collage, and a stellar card. A big welcome to the team–and sorry it’s so late, but I’ve been traveling. Love how you created a scene of late library books (and reminded me that I’ve got some of them as well).